3"Dia. x 7"T; holds 7.8 ounces. Red wine glass sold in sets of four. Made of lead-free crystal. Dishwasher safe; top rack recommended. Holds 18 ounces; approximately 3.75"Dia. x 8.75"T. Imported. 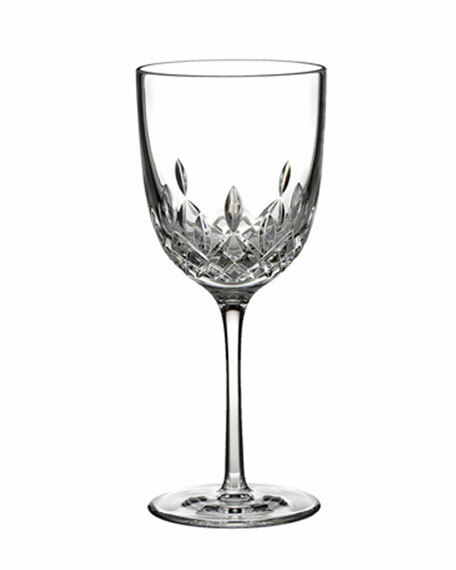 Wine glass designs achieved through many hours of labor-intensive craftsmanship by master glassblowers. Clear, lead-free glass. 3.125"Dia. x 6.75"T; holds 8 ounces. Dishwasher safe. Made in the USA. Handcrafted white wine glass. Introduced in 1952, Lismore is named for a prominent town in County Waterford, Ireland. Created by designer Miroslav Havel. Stem is expertly shaped for prismatic effect. Clear crystal with diamond and wedge cuts; flat base. Holds 4 ounces.